I was in the sixth grade, I think, when I watched part of Camelot in a class, undoubtedly as an example of something to do with the world of Arthurian legend. All that I remember was that it was sickeningly, unbearably sappy. And I have avoided it since, not only due to the sappiness, but because I’ve done a fair amount of reading on Arthurian legend, etc. and I just sort of assumed that the Lerner & Loewe musical made a hash of the story. But, since I am making an effort to see the films of some of the “great actors” of the last generation, among them Richard Harris, I decided it was high time I gave Camelot a try. You know what? I should have done so long ago. It was really quite enjoyable, and far more “accurate” than I would have expected. It’s (very clearly, IMO) based on The Ill-Made Knight, which is part three of T.H. White’s The Once and Future King, a highly successful retelling of the stories in Malory’s Morte d’Arthur. It deals with Arthur (Harris) & Guenever (Vanessa Redgrave)’s marriage, the creation of Arthur’s civil rule and the Round Table, and the disintegration of the ideals of Camelot, brought on in part by the affair of Guenever and Lancelot (Franco Nero). It ends with the separation of the three main characters, rather than the epic final battle between Arthur and Mordred. I can’t believe I’m going to say this, but the movie, despite being a failure upon release, was very enjoyable, and had surprising depth. That’s probably due in large part to Mr. Harris, who famously lobbied long and hard to take over the role originated by Richard Burton on Broadway. He is at once charming, intellectual, dashing, and tormented. He plays the whole thing absolutely perfectly, and he sings while he’s doing it! In defense of my twelve-year-old self, there are some exceedingly sappy scenes, but that is to be expected, I suppose, when one is watching a musical about one of the greatest love triangles in literature. Still, Harris’ Arthur is instantly recognizable as White’s creation, brought up by Merlin to be a sort of “philosopher king,” rather than a savage. Redgrave and Nero both bring solid characterizations to their roles, with Redgrave balancing intelligence with coquetry, and Nero managing to be heroic and completely obnoxious all at the same time. Rounding out the cast is Lionel Jeffries as the lovable and fallible “adviser” to the king, Pellinore, and David Hemmings as the scheming Morded. Hemmings doesn’t get a lot of screen time, but he is marvelously oily and sly while he’s there. The cinematography and costuming are really quite stunning and unusual, and the music is enjoyable, if a bit saccharine at times. It is Lerner & Loewe, after all. I popped the DVD in with a certain amount of trepidation, both for the sappiness and the length of the thing (three hours! ), but at the end, I had enjoyed myself tremendously, and was completely charmed by Richard Harris’ performance. If you’re a fan of Arthuriana, Mr. Harris, or just musicals in general (guilty on all three charges, myself, now) I’d highly recommend this stylized tale of chivalry and destructive love. I actually watched this movie with a few of my Bible-study friends a long while ago, but unfortunately I had to leave early 😦 I remember quite liking it though, and was impressed by Richard Harris and Vanessa Redgrave’s singing, she was sooo beautiful, too. Franco Nero is so dashing in this movie, talk about the Brangelina of that era those two! That project is going to take some serious thought/time before you see anything of it. 🙂 But it’s on a burner, I promise! I may have to see this one. 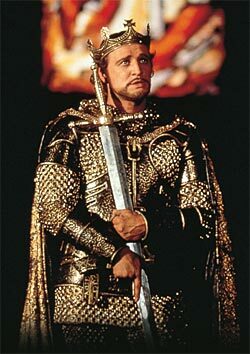 Camelot was spoiled for me in a large way when I saw it live in Pensacola while I was in high school. The production was, in short, horrible. I’d seen it previously (done by a decent company the first time), so I had a basis for comparison. I don’t know who did the casting, but Lancelot had the most nasal voice I’ve ever heard; Arthur was…well, flaccid is probably the best word I can think of; and the very young actress playing Guenever completely stole the show, but she couldn’t have been more than twenty and very obviously at odds with the age group of the rest of the cast. It made for an awkward live production.